Georgian Bay Association (GBA) Asks: Based on recent changes in water levels on Georgian Bay, it appears that the main factor involved is seasonal variations in our climate, rather than “climate change”. What is your take on this? GBA Asks: Water levels seem to be very unpredictable. Is there any way to predict the direction of water levels, or are levels too dependent on short-term factors like the amount of precipitation? GBA asks: Georgian Bay Forever (GBF) points out that fluctuations in water levels are important to maintaining healthy wetlands and biodiversity. Why do variations in water levels improve the health of lake ecosystems? GBA asks: Many people, as well as commercial interests, are very concerned by the hardships caused by very high or very low water levels. Georgian Bay cottagers and residents were very upset with the extremely low water levels that we experienced 3 to 5 years ago, but people don’t want them to go too high either! How can these extremes be managed while at the same time maintaining healthy lake ecosystems? GBA Asks: Recently GBF commissioned AECOM Technical Services, a widely recognized water resources engineering consultancy, to study structures or controls to address water levels in the Upper Great Lakes. What kinds of structures did they study? And what were their findings? GBA Asks: Is GBF’s current position that those kinds of structures AECOM recommends be installed to help to limit the extreme highs and lows of water levels in Lakes Huron and Michigan? GBA Asks: What would the costs be for AECOM's proposed structures, and who would pay for them? GBA Asks: What should the next steps be to address these extreme water levels and Aecom's proposed structural solutions? GBA asks: Based on recent changes in water levels on Georgian Bay, it appears that the main factor involved is seasonal variations in our climate, rather than “climate change”. What is your take on this? Teasing out the differences between what is a weather related water levels variation and what is a climate related water levels trend is the focus of numerous agencies such as Environment Canada (EC) and the National Oceanic and Atmospheric Administration (NOAA). There is a scientific consensus that Georgian Bay water levels will continue decline over the long term due to changes in the climate while climate change driven weather will continue to become flashier in the short term. It is clear that climate change is effecting weather patterns. Climate change induced surface water temperature increases (up 3.5°C in the last century) 2 impact the formation of ice in the Great Lakes (down 71% overall from 1973-2010) 3 . Climate change induced air temperature rises increase the amount of water in the atmosphere and make the storms bigger so they can release more rainfall in those shorter time periods. In its 2012 Upper Great Lakes study, the International Joint Commission determined that there are three main drivers impacting long term water levels in Georgian Bay and Lake Michigan-Huron: (1) climate changes; (2) previous dredging and unexpected erosion in the St. Clair River; and (3) glacial isostatic rebound. While all have contributed, it is currently climate change that was determined to be the main and ongoing driver of long term water levels declines. Short term factors such as wind set-up and low or high atmospheric pressure cells can create seiches – standing waves that can oscillate between highs and lows across the Bay in mere hours. Larger amounts of rainfall are now routinely falling over the lake and in the watershed resulting in rapid increases in water levels over a few days and in some recent cases have deposited a month’s worth of rainfall in mere hours. Normal seasonal variations in evaporation through the colder months and rainfall produce the typical winter lows and August peak levels that we are used to in Georgian Bay and that are critical to maintaining healthy coastal wetlands supporting clean water and habitat for the large number of creatures and plants that depend on them, but these highs and lows are getting flashier. And finally, unlike Lake Superior and Lake Ontario, there are no control structures available in the upper Great Lakes to help offset these unnatural conditions. A wait and see attitude doesn’t help the $5.8 trillion dollar economic region to plan for the future or protect our precious ecosystems. For that reason, Georgian Bay Forever recently hired world renowned engineers at AECOM Technical Services to investigate how we might improve climate resiliency in the Upper Great Lakes until the human induced components of climate change can be reversed. 3 Based on Annual Average Ice Cover on all five Great Lakes and Lake St.Clair. The weekly/monthly climatology of the period 1973–2010 was analyzed. The weekly/monthly mean value(i.e., climatology) was subtracted from the individual weeks/months to obtain the weekly/monthly anomalies. Annual-averaged ice cover values were obtained by averaging data in the whole winter season (i.e., ice year). Source: Great Lakes Ice Coverage. GLISA, a NOAA RISA Team. Retrieved from http://glisa.umich.edu/climate/great-lakes-ice-coverage. Although water levels fluctuate daily and sometimes even hourly, seasonally we have a reasonable expectation that water levels will start low in the spring and peak in the summer typically rising on average a foot or more. Season over season these levels have historically fluctuated over seven feet from the record high (1986) to the record low (2013). But in spite of this variability, there are ways to predict longer term average water levels. Environment Canada (EC) and the National Oceanic and Atmospheric Agency (NOAA) have produced computational models that can, with a degree of certainty depending on the timescales involved, forecast where waters levels will go. Short term models focus on the next six months and are highly accurate having been refined with weather data and actual measurements taken over the past 100 years. Interestingly, these models have had to estimate the “over-lake” components of precipitation and evaporation because no on-the-lake measurements were historically available. This past year, for the first time, weather station equipment was installed on one of Canada Steamship Lines vessels in the Great Lakes. This vessel has accurate Global Positioning System (GPS) tracking information to go along with the measurements and is helping to provide an even better understanding of the Great Lakes microclimate to further improve these models. Slightly longer term models push the forecast out one year in advance. Evaluations show that these models are slightly less accurate than the short-term models, but still provide a reliable forecast of the impacts of global weather systems and effects of phenomenon like El Nino, the “Polar Vortex” and the jet stream on lakes levels. NOAA provides these forecasts to shippers and industries throughout the Great Lakes Region so they can plan freight movements throughout the year. You can find these on our website at http://gbf.org/water-levels/current-water-levels/ . Finally, a few modellers have produced long term climate models that look forward 30, 50 and even 70 years into the future. The reliability of these models remains to be seen, but the consensus of these models is weighted towards declining water levels in the upper Great Lakes. It is often noted that due to the recent political nature of these scientific studies, their results are usually skewed conservatively and often underestimate the actual impacts. This is concerning enough to support the development of a mitigation strategy such as that introduced by GBF in our AECOM Great Lakes Climate Resilience study. The possible addition of new climate resiliency tools in the Upper Great Lakes would allow for protection of Lake Erie and Michigan-Huron from unnatural extreme high and low water levels just as Lake Superior and Lake Ontario are currently. GBF is working with agencies and governments to move this process forward. GBA Asks: GBF points out that fluctuations in water levels are important to maintaining healthy wetlands and biodiversity. Why do variations in water levels improve the health of lake ecosystems? Our native plants and animals have evolved and adapted to historic conditions in the upper Great Lakes. 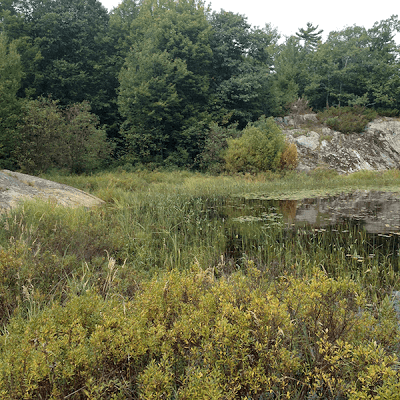 The competitive success of those plants at their favourite water levels ensure that there are a variety of plants that can provide shelter, protection and food for the large number of species that call these wetlands home. Seasonal variations in water levels are predictable in the Great Lakes and allow native plants to germinate in sun-warmed, wet soils and then grow in the water as levels rise over the summer. Other plants grow in deeper water at the appropriate limits of sunlight penetration. On a gradually sloping, soft lake bed, these plants can naturally “move” towards or away from the shoreline depending on the water levels so that they experience their ideal water level requirements. But much of the Eastern Georgian Bay archipelago has a more abrupt drop-off with little resilience to extreme lake levels. An easy way to see how water levels impact wetlands and biodiversity is to look at two examples of what happens when water levels don’t fluctuate. Since 1957, the water levels in Lake Ontario have been controlled through regulations by power dams in the St. Lawrence River at Cornwall. The water regulation plan was a compromise between shippers, power generators and shoreline stakeholders that didn’t incorporate any environmental protection. As a result the Lake Ontario wetlands collapsed into mono-culture cattail marshes with limited biodiversity that supported only a few species. The International Joint Commission (IJC) just approved a new regulatory plan (Plan 2014) that with the stroke of a pen will restore over 60,000 acres of coastal wetlands by increasing the allowable range of water level fluctuation towards more natural variability. Another example in Georgian Bay started in 1998 and continued until 2013 with the water levels at sustained record low levels. Numerous coastal wetlands changed to coastal meadow with fewer species, more woody plants growing and overall reduction in ecological services. Over the past three years, as water levels have come back to average levels, those shrubs and small trees have started to die off and the more biodiverse wetland has emerged. GBF partnered with the National Aeronautics and Space Administration (NASA) and discovered that from 1987 high water levels to 2013 low water levels, the wetlands in Southern Georgian Bay declined by 10% while northern Georgian Bay wetlands, where the inner coastal waters are shallower, actually increased by 7%. Overall there was a 3% loss in Georgian Bay coastal wetlands as water levels dropped. (For more information on this study, click here ) Coupling this finding with the modelling forecasts trending towards lower water levels suggests that there may be future severe habitat impacts that could be devastating to our already numerous threatened species. While climate resilient controls would mitigate much of this, we are still missing a detailed inventory of coastal water depths and substrates available in the Bay. This detailed coastal bathymetry data collection is another ongoing GBF project. *** What does bathymetry mean? The measurement of depth of water in oceans, seas, or lakes. Just like the porridge in Goldilocks bowl, there is a “just right” scenario for water levels in the Great Lakes. Those water levels in Lake Michigan–Huron would continue to fluctuate seasonally and vary annually over a six to seven foot range – the same as the lakes did prior to the unnatural impacts of climate change, dredging and erosion in the St. Clair River. Our native plants and animals have evolved to adapt to those ranges, and our industries, residents and cities have similarly developed infrastructure to cope with the fluctuations between those natural extremes. Without some additional tools to improve climate resilience and overcome the unnatural fluctuations beyond those historic levels, extremes will continue to financially impact residents and businesses as well as our natural co-habitants. Through the modelling presented in the International Joint Commission’s (IJC’s) Upper Great Lakes study, it was determined that additional control structures in the St. Clair and/or Niagara Rivers could mitigate these undesirable exceedances. The IJC indicated that an examination of structural measures to reduce pronounced lake level fluctuations had merit, while acknowledging that such a review was beyond the scope of its study. GBF engaged world renowned engineering firm AECOM Technical Services to pursue the examination of this question of whether it was possible and cost effective to increase climate resilience in the upper Great Lakes. AECOM was able to determine that state-of-the-art, flexible climate resilient tools could be cost effectively added to mitigate the ongoing impacts of climate change and maintain healthy seasonal and year-over-year fluctuations in water levels to protect our precious habitat, economy and ecosystem. The new IJC regulation 2014 for Lake Ontario makes use of the existing control structures in the St. Lawrence River that control Lake Ontario’s water level to protect its coastal wetlands and all its stakeholders from these same expected impacts. Since 1957, water level control was managed too tightly in Lake Ontario and turned its coastal wetlands into cattail marshes with limited biodiversity and support for species. The new regulation will reverse this damage and increase the water levels fluctuations to increase biodiversity and improve water quality while still protecting the economic interests of the Lake’s stakeholders. AECOM has recommended that the governments of Canada and the United States of America create a detailed plan for protecting the upper Great Lakes by building on the findings of their work for GBF. GBF continues to work towards achieving that plan. GBA asks: Recently GBF commissioned AECOM Technical Services, a widely recognized water resources engineering consultancy, to study using structures or controls to address water levels in the Upper Great Lakes. What kinds of structures did they study? And what were the findings? GBF answers:In its 2012 International Upper Great Lakes Study, the International Joint Commission indicated that an examination of structural measures to reduce pronounced lake level fluctuations had merit, while acknowledging that such a review was beyond the scope of that study. GBF engaged world renowned AECOM Technical Services to address that unmet need by investigating viable structural options for the long term climate resilient protection of water levels in the upper Great Lakes. Through identification and evaluation of various long-term measures (i.e. physical infrastructure), the intent was to explore means to better regulate the level of Lake Michigan-Huron to mitigate the impacts of climate change and protect the $5.8 trillion Great Lakes regional economy (including $976 M in waterfront property value loss assessment over the next 33 years1). In this context, “climate resilience” pertains to the capacity of the system to adapt to a range of climate-induced stressors to maintain and sustain ecological function and economic value over the long-term. The study entailed the examination of over a dozen structural alternatives for lake level control within the Great Lakes -St. Lawrence River System. The alternatives were categorized as: Compensatory Structures (i.e., submerged sills, weirs, jetties, river training walls, wing dikes); Power Generating Structures (i.e., conventional hydroelectric dams, In-stream turbines); Adaptive Management Structures (i.e., inflatable flap gates, inflatable dams, control/sector gates); and “Other” Structures (i.e., ice booms, landfill and control gate structures). They include well-established, extensively researched structures, emerging technologies, and new ideas developed specifically to address lake level controls within the Great Lakes-St. Lawrence River System. These various alternatives were examined in light of existing data and information, and subsequently evaluated on the basis of seven criteria that include performance, implementation feasibility, cost, regulatory requirements, climate resiliency, environmental impacts, and social/cultural considerations. The evaluation culminated in the selection of three illustrative alternatives for additional analysis and “concept level “development. What were Aecom’s findings? What are the 3 alternatives? The most important finding of AECOM’s team based upon the available studies and modelling was that there is a need to move forward and that there are cost-effective ways to increase Climate Resilience in the upper Great Lakes through the introduction of new management tools to offset the unnatural impacts of climate change. AECOM’s evaluation of what these tools might look like culminated in the selection of three illustrative alternatives for additional analysis and “concept level” development. These first three examples included power generating structures, flexible control structures and renaturalizing parts of the connecting channel between Lake Michigan-Huron and Lake St. Clair. It is clearly understood that the actual solutions implemented would need to be created through a comprehensive engineering and environmental impacts review process to ensure that Lakes Michigan-Huron, Erie and the entire Great Lakes St. Lawrence River system is properly protected as an integrated system. 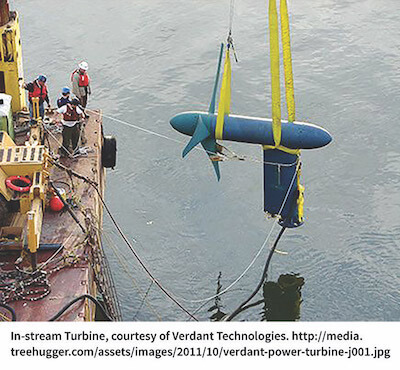 • In-stream Turbines to be installed on the river bed of the Upper St. Clair River by the Blue Water Bridge, as well as upstream of the St. Mary’s River Compensation Works in Lake Superior. By reducing river flow when in operating mode, the turbines impact river hydrodynamics, increasing water levels upstream and decreasing levels downstream, as needs dictate. They can be operated during low flow periods (to raise upstream levels) and can be shut down during high flows. Power generation is a significant ancillary benefit. • Inflatable Dams to be installed in the St. Clair River at Stag and/or Fawn Islands. When the inflated dams are operational, river flow is reduced with a resultant increase in upstream water levels. During higher than desired levels, the dams are deflated to allow for increased river flow. 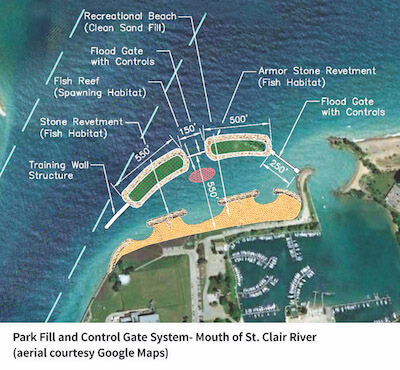 •A Park Fill/Control Gates System to be constructed at the mouth of St. Clair River. The proposed structure is composed of two new islands (involving stone revetment, sand fill, topsoil and landscaping) and two flood control gates that will be adjusted, as needed, to reduce river flow and increase upstream water levels. The gates can be opened to allow for increased river flow when water levels are higher than desired. An important ancillary benefit is the creation of a park offering the public many opportunities for water-based recreational activities. The constructed islands would have positive environmental benefits (e.g., aquatic habitat, fish spawning reef) while recognizing /adverse impacts during the construction process. All three of these structural alternatives have significant strengths: they are proven technologies in freshwater systems, are adaptable to changing climate and water level conditions and, compared to other alternatives investigated, have favourable environmental and socio-economic characteristics. AECOM has recommend that the governments of Canada and the United States of America continue with the more detailed engineering project needed and GBF continues to work to promote this project. To view the full summary, visit here. 1 Shlozberg, Reuven & Dorling, Rob & Spiro, Peter. Low Water Blues. An economic Assessment of Future Low Water Levels in the Great Lakes and St. Lawrence River. Executive Summary. ISBN 978-1-927350-77-5. Mowat Centre and Council of the Great Lakes Region. Retrieved at https://georgianbayforever.org/wp-content/uploads/2015/10/low-water-blues-exec-sum.pdf. The study was also partially funded by the Ontario government and Georgian Bay Forever. GBA Asks: Is GBF’s current position that those kinds of structures should be installed to help to limit the extreme highs and lows of water levels in Lakes Huron and Michigan? Based upon the modelling showing future Great Lakes water level declines, research into the adverse ecological and economic impacts of climate change on the Great Lakes Region and the evidence presented in various official government reports as well as GBF’s own studies, GBF does believe that the most cost effective way to address the unnatural impacts of climate change on the Great Lakes is through the addition of a suite of climate resilient tools. These flexible tools will allow an adaptive management approach to the mitigation of these adverse impacts. Adaptation to these changes without such tools will be far more costly and detrimental to the $5.8 trillion dollar regional economy and be devastating to our fragile and already heavily damaged ecosystems. The evidence strongly suggests that something must be done to mitigate the effects of climate change and manage the risks we all face from the resulting extreme high-highs and low-lows we have seen in recent decades in the water levels of Lake Michigan-Huron and Georgian Bay. Our studies show that there is a significant positive financial benefit to adding viable structural options for the long term climate resilient protection of water levels in the upper Great Lakes. Any approach has to recognize the interrelatedness of the whole Great Lakes- St. Lawrence River System. Aecom and GBF recommend that the International Joint Commission and the two federal governments support detailed design work on the 3 alternatives (in-stream turbines, inflatable dams and a park fill/control gates system) to better understand their potential to augment existing lake level control plans, procedures and structures. To view the full summary of the AECOM report, visit here. GBA Asks: What would the costs be for AECOM’s proposed structures, and who would pay for them? Our assessment is that the projected construction costs of between 37M to about 200 M USD to introduce climate resilient tools is far more cost effective than passive adaptation and more fairly shares the cost burden evenly amongst all Great Lakes stakeholders rather that disproportionately impacting specific regions. There are also a number of synergistic initiatives underway in the Great Lakes region such and the Great Lakes Navigation System infrastructure investments, the Council of Great Lakes Governors Maritime Initiative and the “Soo Locks” expansion project that could provide opportunities for collaboration. In-stream turbines: Note that the number of units required for each location (2 recommended) is unknown at this time. For one location at the St. Clair River location, it is assumed that the minimum number is 56. For the St. Clair River location the preliminary estimated costs range from 37 M to 100M USD, for 56 to 150 turbines. Annual operations and maintenance costs are estimated to be 1.5% of the initial capital cost, or between $0.55M and $1.5M. 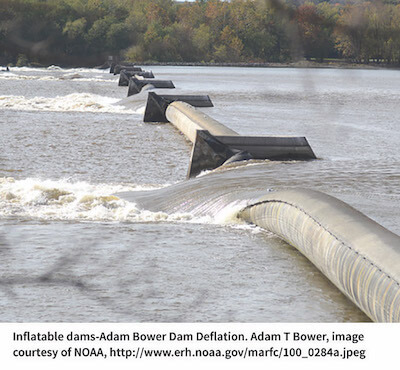 Inflatable dams: Estimated construction costs are $81.5 M (Stag Island) and $30.1 M (Fawn Island). Annual operations and maintenance costs are assumed to be 2.5% of capital construction ( $2M and 750k respectively). Every 10 to 12 years the inflatable membrane needs to be replaced (17M and 7.3 M for Stag and Fawn islands respectively). The estimated construction costs do not include and necessary mitigation measures (if required) in the west channel. 1 Shlozberg, Reuven & Dorling, Rob & Spiro, Peter. Low Water Blues. An economic Assessment of Future Low Water Levels in the Great Lakes and St. Lawrence River. Executive Summary. ISBN 978-1-927350-77-5. Mowat Centre and Council of the Great Lakes Region. Retrieved at https://georgianbayforever.org/wp-content/uploads/2015/10/low-water-blues-exec-sum.pdf. The study was also partially funded by the Ontario government and Georgian Bay Forever. GBA Asks: What should the next steps be to address these extreme water levels and Aecom’s proposed structural solutions? Although these technologies are promising, they have only been examined at the conceptual level based on existing data and information. Data gaps and information needs must be fully addressed to ascertain, in detail, their potential applicability to the Great Lakes. This includes additional research and modeling to determine, with a degree of precision, factors such as their individual and collective water level control capabilities, desired engineering and design features, installation and operational costs, regulatory considerations, and perspectives of affected parties. GBF and Aecom are engaging stakeholders around these three alternatives in order to consider the preferences and suggestions of various affected parties, and endeavour to maximize ecological and economic benefits while minimizing or eliminating social, cultural and other concerns.